There are 30,000 islands that make up the archipelago of Stockholm. 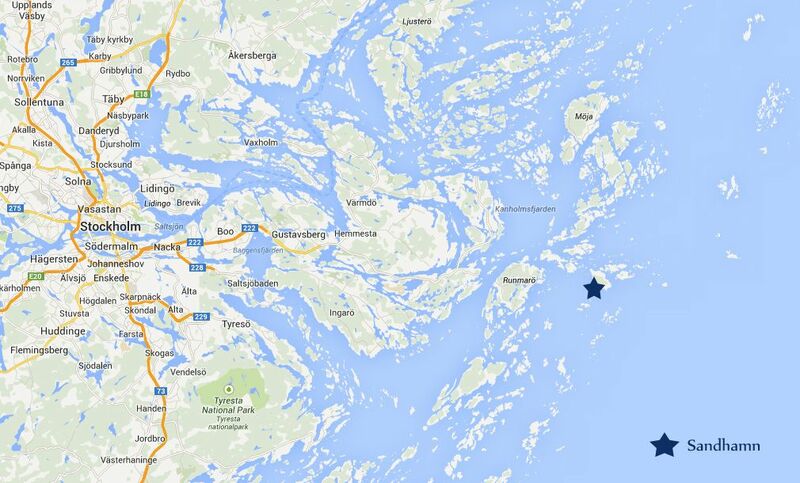 These small islands dot the shoreline of Sweden, separating the city of Stockholm from the Baltic Sea. 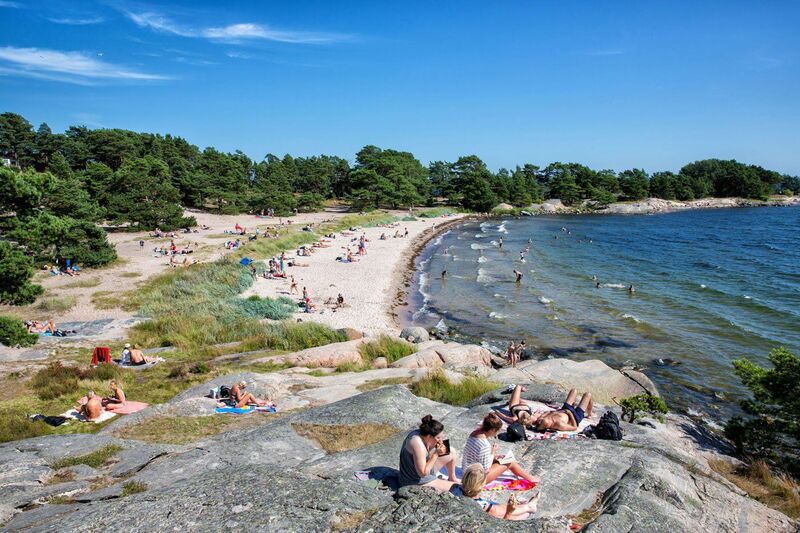 About 150 of these islands are inhabited year round, and several make a great day trip from Stockholm. 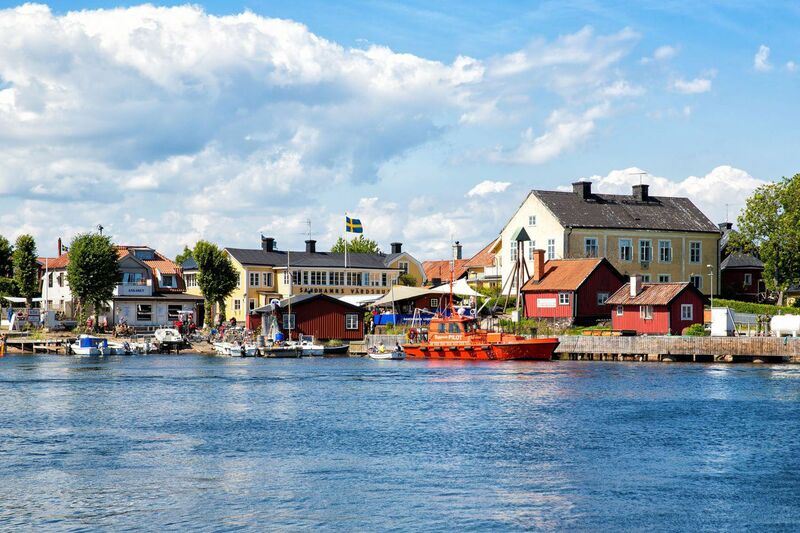 The most popular islands to visit are Grinda, Vaxholm, Svartso, and Sandhamn. These islands are connected with Stockholm by a frequent ferry service, the main companies being Waxholmsbolaget and Cinderella Batarna. 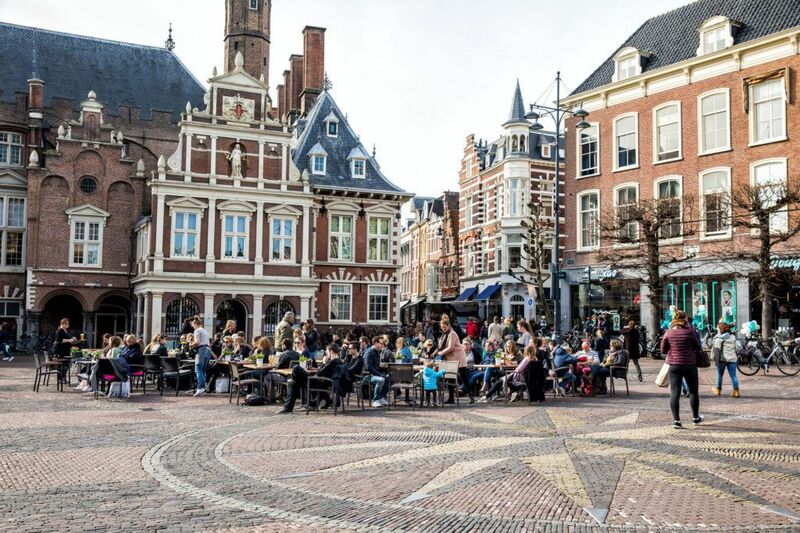 The very ambitious traveler can briefly visit two or three of these islands in a day with a well planned ferry schedule. 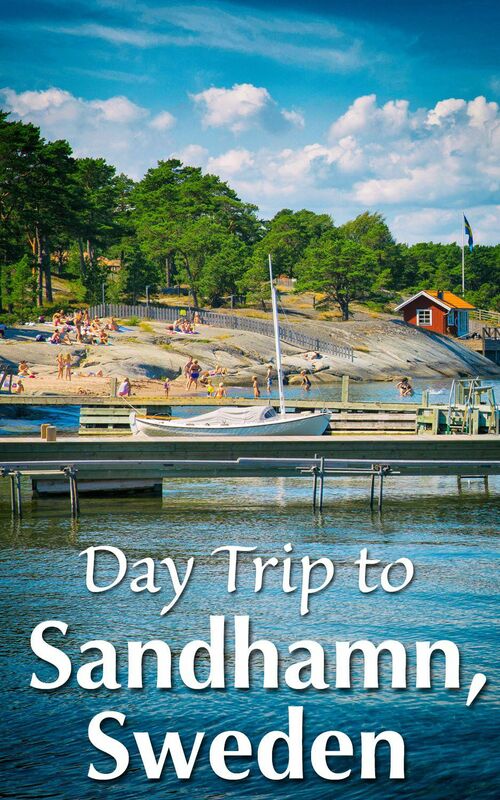 We chose to visit Sandhamn, the island farthest from Stockholm and the last stop before entering the Baltic Sea. Here is our experience. From Stockholm, we took the 9:30 am ferry on Cinderella I. The Cinderella ferries were very conveniently located right out front of our hotel, the Hotel Diplomat, on Strandvägen. The four of us found seats with a table next to a window with views outside. Once on board we bought our tickets and got comfy for the two hour ride to Sandhamn. Along the way we stopped at small towns, saw hundreds of rocky, forested islands, and saw numerous cruise ships. We had good views along the way from our seats, but as the ferry picked up more passengers it became very hot and crowded. Tim and I couldn’t wait to get off of the boat. 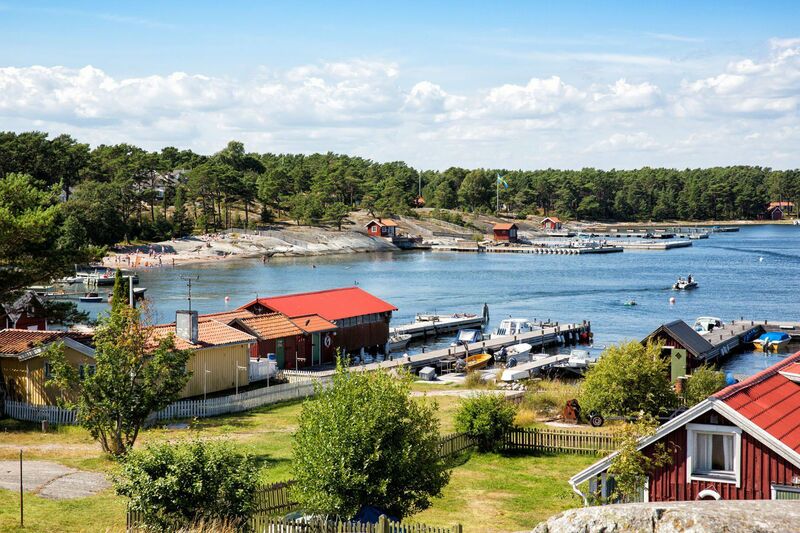 The island of Sandhamn (meaning “sand harbor” in Swedish) is charming. Small timber shops and homes surrounded the harbor. The harbor was dominated by the Sandhamn Yacht Club, and small yachts and sailboats filled the harbor. We found a shop, Peak Performance, which rented mountain bikes and kayaks. 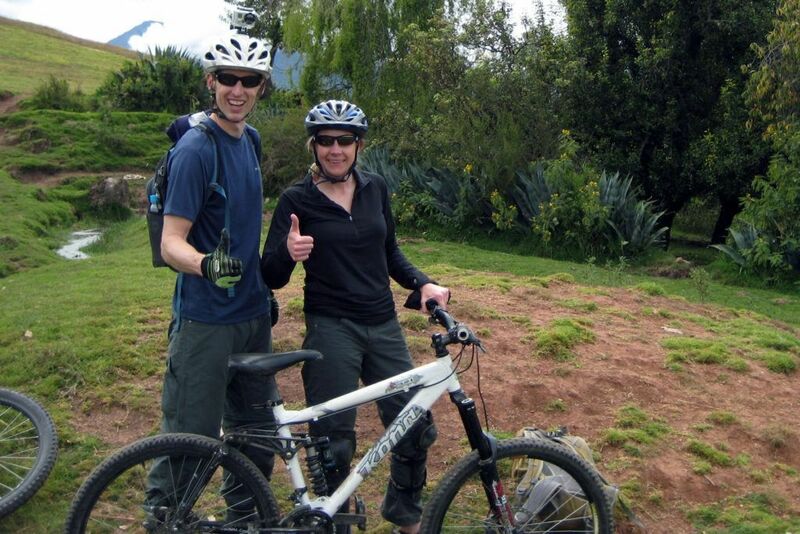 We rented four bikes and started our exploration of the island. At first cycling around the island seemed to be a bad decision. The streets were crowded with people which made biking difficult. Kara’s bike was a little too big for her, so she had a hard time getting started on it and then controlling it. I worried that she was going to have a major wipeout or take out a pedestrian. 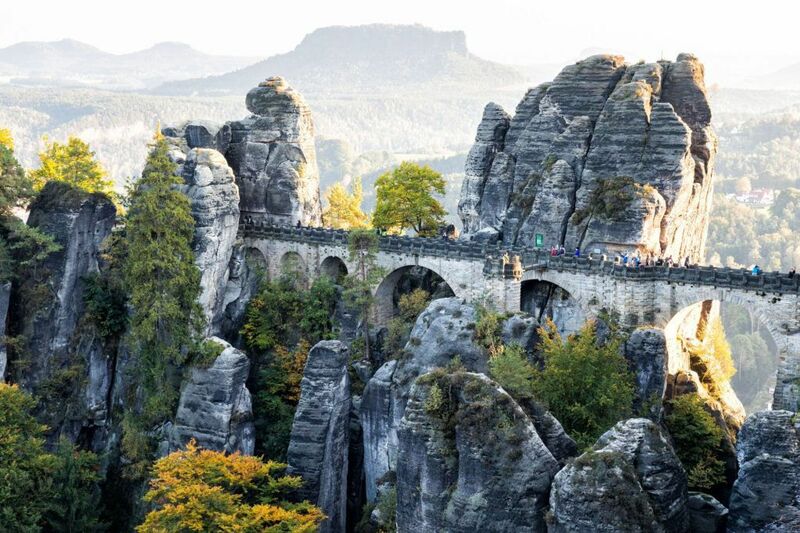 Once we got away from the crowds, biking became more fun. Tim took us on a tour through the narrow, gravel streets and timber cottages. We biked through what looked like a whole neighborhood of red and white cottages with small, fenced in yards. It was lovely. After Kara almost wiped out into a stone fence we decided to take a break. Back at the harbor we ate lunch at Ankaret. Tyler had a ham and cheese sandwich, I ate shrimp salad, and Kara and Tim ate pancakes with jelly and whipped cream. Cycling around Sandhamn after lunch was terrific! First we cycled down a long, gravel and dirt road (Trovillevägen) to the southern point of Sandhamn to Trouville Beach. The Swedes were laying out in bikinis and bathing suits in 75°F weather, enjoying the few warm days they get all year. From what I hear, winter here is long and bitterly cold. Tyler and Kara used this time to climb on the rocks. Tim and I spent the time people watching. While playing on the rocks Tyler slipped into the ocean, getting his shoes and socks wet. So we joined him. 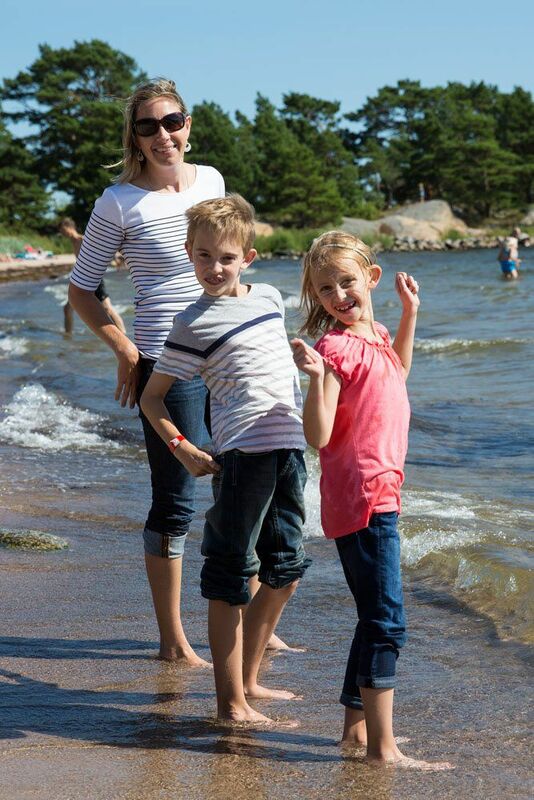 We all took off our shoes and socks and put our feet into the Baltic Sea. The water was much warmer than I expected. It felt about the same temperature as the Atlantic Ocean in Ocean City, Maryland during the summertime. What a pleasant surprise! From the beach we cycled through sandy trails and through pine forests. Kara continued to fall numerous times. She thought it was funny and frustrating at the same time. 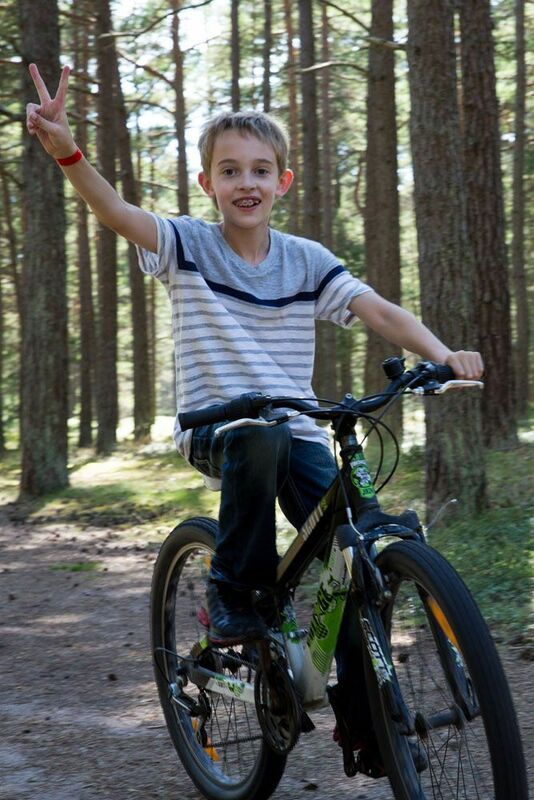 Tyler’s bike handling skills were great; he really enjoyed his first time mountain biking through the woods. We finished our tour of Sandhamn back at the harbor. 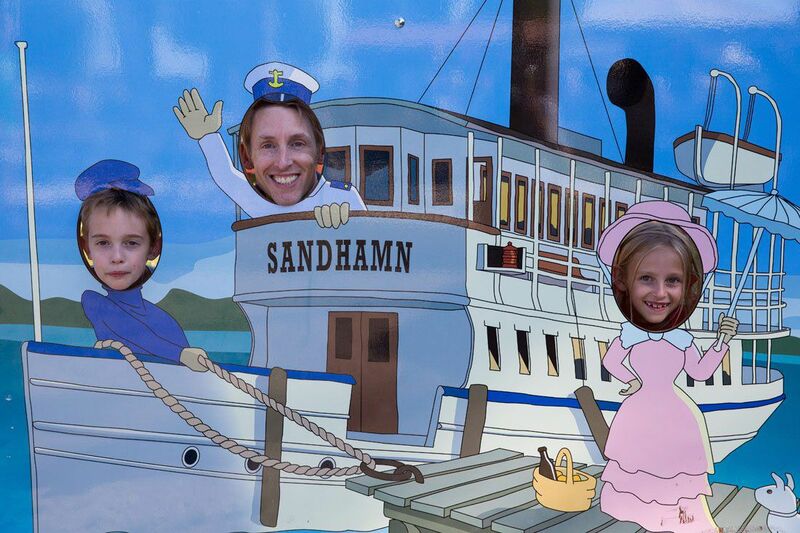 After returning our bikes we ate some ice cream, then boarded Cinderella II back to Stockholm. This time we sat in the very back of the boat. Our views were better and with the continuous breeze we all actually felt a little cold. By 7:00 pm we were back in Stockholm and on a search for another expensive Swedish dinner. 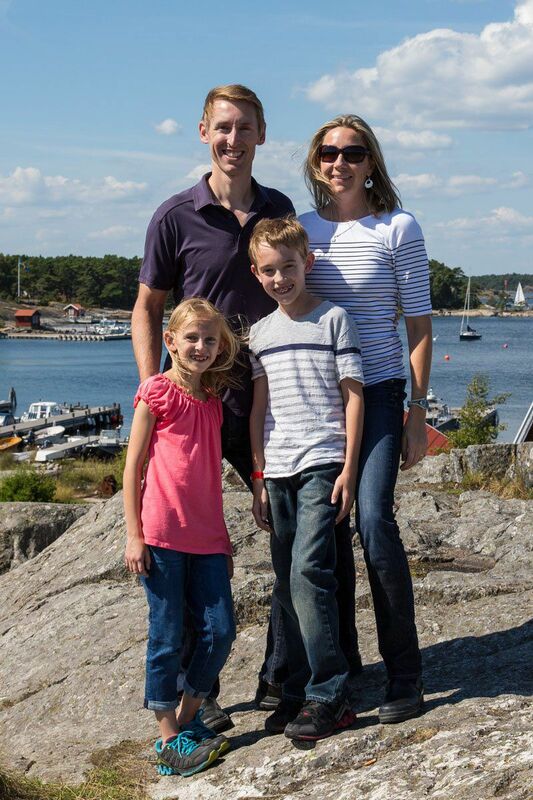 There are two companies that offer ferry services from Stockholm to Sandhamn, Cinderella Båtarna and Waxholmsbolaget. 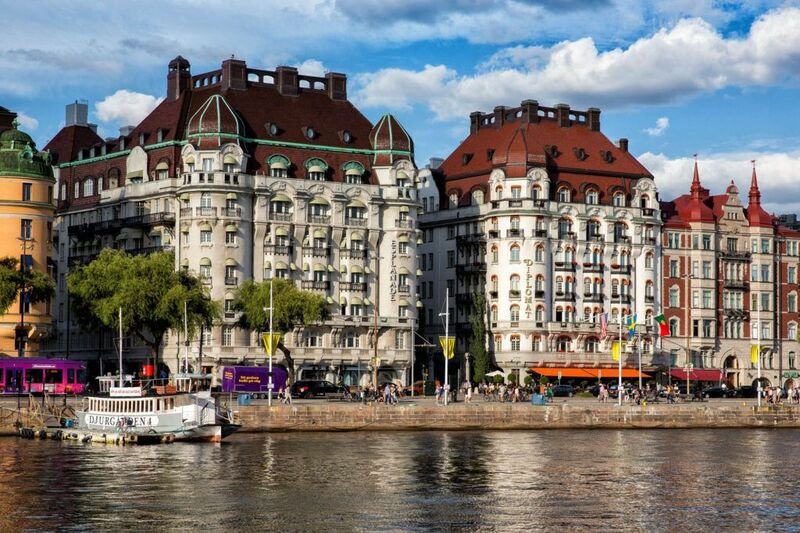 We used Cinderella Båtarna because we could board the ferry right outside of our hotel, the Hotel Diplomat. Cinderella Båtarna: Prices start at SEK 170. For timetables and the link to book your tickets online, visit the Cinderella website. Waxholmsbolaget: Their website is less user friendly. Timetables are released one month ahead of time. Visit their website here. It takes 2 hours and 15 minutes to sail between Stockholm and Sandhamn. 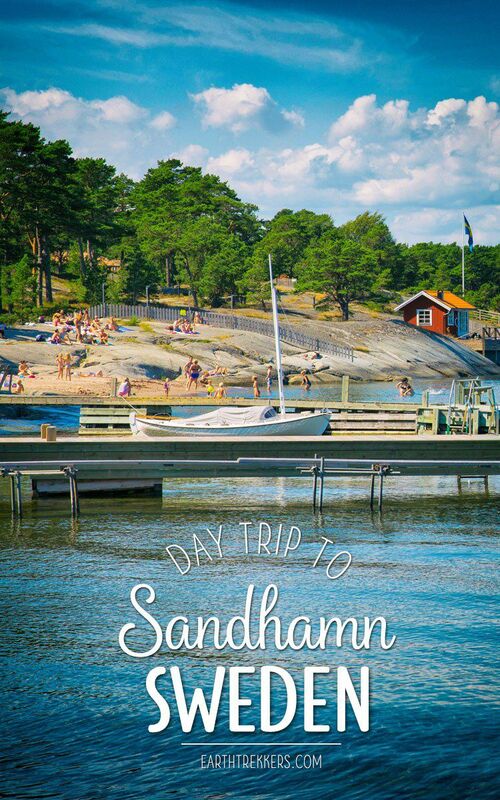 The island of Sandhamn is small, so you can explore most of it in just a few hours. 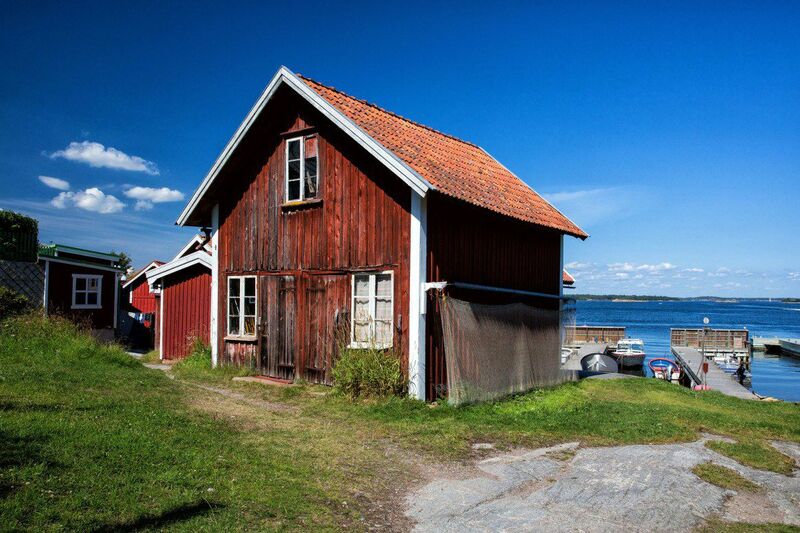 Once on Sandhamn, you can get around by bicycle, kayak, and walking. To get to Trouville Beach, it is a 20 minute walk or a 10 to 15 minute bike ride (1.7 km one way). 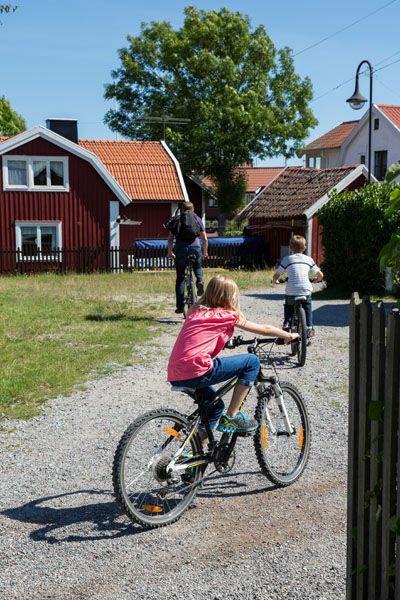 Learn more about Sandhamn (and get updated information on bike rentals) on the Sandhamn website.